A reader asked what the &H?? strings were in the malware I analyzed in my last diary entry. These are numbers in VBA written in hexadecimal. For analysis, these numbers can be easily extracted with my re-search.py tool and then converted to binary with hex-to-bin.py. 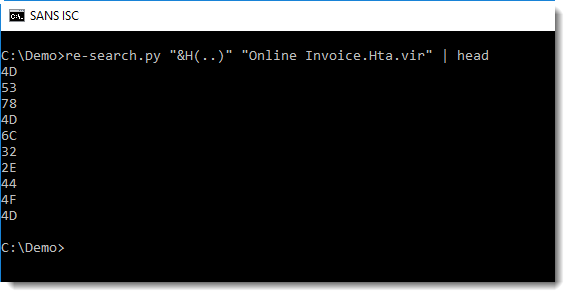 In this HTA document, the malware authors tried to obfuscated strings like MSXML2.DOMDocument.3.0 that are used in AV signatures and other detection tools.